As we get ready for sunny skies and rising temperatures this April, subscribe now for free to read Real Style’s hot and new April 2018 issue! 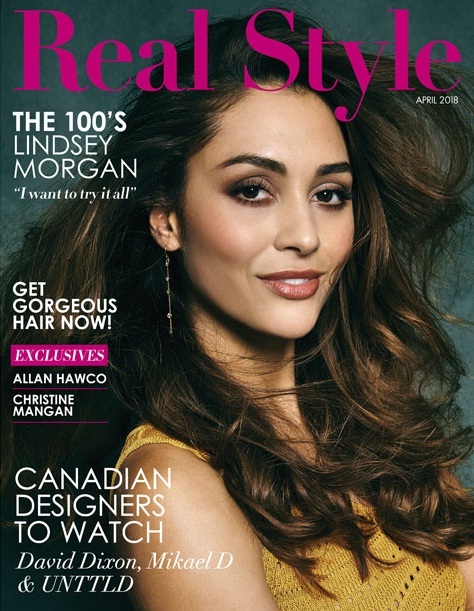 For the month of April, our cover girl is the beautiful star of The 100, Lindsey Morgan. The 28-year-old actress shares everything about her Hollywood journey to rising stardom, her biggest celebrity role models and much more. Meanwhile, we also bring you an exclusive interview with Canadian actor Allan Hawco, who stars in the CBC miniseries Caught. From his experience working with heartthrob Jason Momoa on Frontier to why is proud to call the True North home, Hawco talks life on and off the screen. Speaking of Canada, it wouldn’t be another issue of Real Style with the latest and greatest from our favourite homegrown designers! This time, we sat down with Montreal-based emerging stars UNTTLD, established pro David Dixon and eveningwear star Mikael D. From their creative inspiration to their Spring 2018 favourites, these three talented designers shared their vision with us. In the world of beauty, we bring our focus to achieving flawless hair with our Hair Repair 101 feature. Check this out for the best expert tips for getting a silky smooth hairstyle and maintaining your spring colour, right at home. Also exciting is our exclusive interview with author Christine Mangan, who tells us everything about her buzzed-out debut novel Tangerine. Just like every month, we also have the newest in culture news, from TV shows to theatre. Subscribe now to enjoy the issue!